– Crocs™ footwear is ideal for casual wear, as well as for professional use and recreational activities. – In June 2004, Crocs purchased Foam Creations and their manufacturing operations to secure exclusive rights to the proprietary foam resin called Croslite. Croslite is a closed cell resin. The foam forms itself to a wearer’s feet and offers purported medical benefits, according to a number of podiatrists. and odor-resistant qualities that Crocs wearers know and love. and were accepted by the American Podiatric Medical Association in 2009. In 2008, the U.S. government Centers for Medicare and Medicaid Services approved a model of Crocs with molded insoles as diabetic footwear, to help reduce foot injuries. “These shoes are especially light ” says Harold Glickman, DPM, former president of the American Podiatric Medical Association (APMA). and I wear them all the time,” Glickman tells WebMD. Efraim Manzano had run the HURT 100 in Hawaii in Crocs. – “ You have plantar fasciitis.” ! … And then he delivered what I thought was the next bad news. “I want you to go out and buy a pair of Crocs. 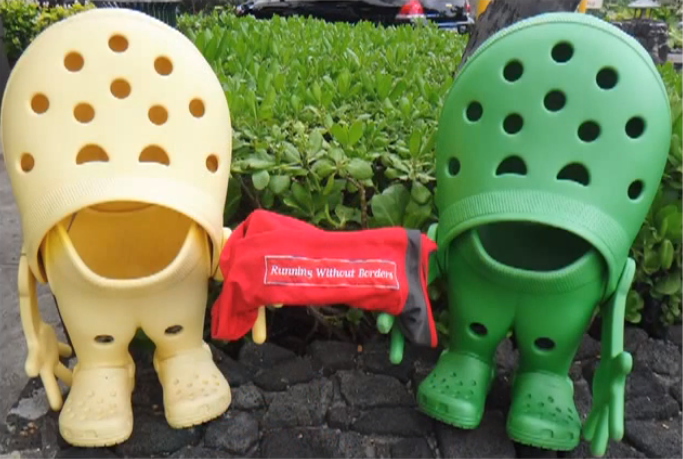 – CrocRunner – Thanks to Crocs I Can Run Again !! – A true story…. and I absolutely DON’T recommend readers to run in Crocs. You should NOT do or want to do what I do ! You should NOT trust what I say ! You should NEVER try this at Home or try at your own risk and at your own will ! Crocs: Healthy Shoes or Just Comfy ? but they’re no substitute for the real deal. it gets overused by people who need more support than they can get from the shoe,” Baravarian tells WebMD. And it’s not made for marathon wear either, adds Baravarian. !